I think Brian Godawa has taken on a worthwhile project of writing fiction based on the Bible which does not contradict or distort the redemptive themes of the Bible, which so often disappoints many of us. Extra-biblical literature has often done this ever sense the Bible has been on the scene. In informative appendices, Godawa helps us navigate this literary genre of ancient biblical fiction and legend and shows us from which of these stories he has drawn in order to fill out his own fictitious portrayals of the biblical people, places and things. In keeping with his Evangelical convictions, and his Schaefferian approach to Christian apologetics and the Christian worldview, he has written these into his fantasy narrative in ways which many may reject as at times appearing to be nothing but sheer politically conservative, or Republican partisan rhetoric. Finding allusions to Bill Clinton's appeal to the "definition of is," and his famous remark "I feel your pain," as well as the 99% rhetoric of the more recent Occupy Wall Street movement put into the mouths of antagonists will be the last straw for some who are unfamiliar with Godawa's apologetics and worldview based on those of the Reformed popular apologist Francis Schaeffer. But being both a Republican and politically conservative, I found these allusions amusing and enjoyed reading a novel which defies the mold of political and philosophical progressivism which reigns in the entertainment industry in which Godawa makes part of his living as the screenwriter of, most notably, To End All Wars, starring Keifer Sutherland. Godawa's ambitious project in speculative Biblical fantasy is also inspired by the classic writings of both J.R.R. Tolkein and C.S. Lewis. In the spirit of Tolkein, he has created an elaborate fantasy world by literalizing the "mytho-poetic" literary and legendary references of the Bible and ancient extrabiblical pseudapigraphy (falsely attributed); in that of Lewis, his motivation is to baptize the imagination of his readers to help them better get the redemptive themes of the Bible so that when they come to the Bible itself, they will find what they read more familiar. This review will be completed at a later date at www.capthk.com. Subcribe to my RSS feed or sign up for an email update so you don't miss it. Intending to read the whole series, I started with this one in order to follow it chronologically. Maybe that was a mistake.This was a good idea and a great setting for a fantasy tale. Also, the author had to have done some research in Enoch, the Bible, possibly Jasher and some other sources.I think I would have enjoyed a summary of his research more than this novel. But that's probably not the case for most readers. What grates on me are major selling points for others. In particular the "cute" romance elements didn't sit well with me at all. And I get a little more irritated every time I run into the obligatory amazon superninja character. So in the author's defense, my patience had been sorely taxed before I ever heard of him, so it only takes a straw or two to break my camel's back.My camel's name is Suspension of Disbelief.The author did build a quest tale, of sorts, around the historic sketch left us via Genesis and Enoch 1, with some plot twists and such. I can't say I liked any of the characters enough to become absorbed, or even smooth over the parts that ruffled my feathers. I set the book down for a couple months before forcing myself to finish it. Having heard raves about the Noah book, I'm almost tempted to give him another chance, but it's certainly not a priority. I really enjoyed this book. Methuselah was a hilarious character & I laughed out loud through out this book. I appreciated the fantasy thrown in with this story too, though who's to say in those ancient times when the fallen angels actually walked among humans as gods what kind of crazy creatures & things were commonplace then that would be pure fantasy today? 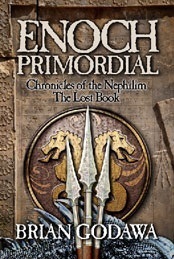 My only question is why is this the second book in the series when Enoch was Noah's great-great-grandfather? I read this book first BC of that reason. I am truly debating if this would have been better first over Noah or not. Though I did feel it explained a few things from Noah primeval.I did find this was a page turner that was also difficult to put down. This, of course, explains why it only took a few days to read. I was completely held through this book and as a christian also made them more real to me as well.I have already started the third on in the series and it is holding me just as his others. I will certainly be adding Brian Godawa as another author I enjoy reading. This book is the 2nd book by Brian Godawa I have read, and I don't recommend it to anyone. In addition to it's violence, it obviously has a political agenda. Brian seems to have the conviction that capitalism is in God's plan. Sorry I tried to read this book. This was an interesting idea, a fantasy adaptation of pre-biblical legends, but it turned out to be a vehicle to promote a Conservative Christian point of view complete with commentary on unions and "takers" and traditional marriage (even though polygamy was widespread in biblical times). Great storyLots of action an suspense. I like how the writer weaves the facts of the bible with fiction, trying not to cross the boundary of too much fantasy. I did have an issue with the ridiculous pet names for each other. They were ridiculous and not needed. Fantastic readGodawa does it again with the follow up to Noah Primeval. It was a great read. This time around - unlike with Noah - I took the time to read through the appendices, and I'm really glad that I did. I can truly appreciate the background information he provides, including plenty of scripture as well as extra biblical narrative, to build a case for the scriptural basis and theological "accuracies" of the way he has portrayed these biblical characters and stories. A lot of heavy research and knowledge has gone into these novels, and I can't wait to pick up the next one and again be blown away by the stories you DIDN'T hear in Sunday School! A thoroughly engaging, thoroughly Christian fantasy based in the Biblical narrative and what may be guessed from ancient records. There's also a healthy dose of not-so-subtle reference to modern ideals with appropriate attribution to their true source. The author appears to be conservative as well as Christian. If you are comfortable with the level of conjecture necessary to create a story from the little we have in the Bible and like the genre, you'll like this.Though the book is the second in the series, the events described are actually prior to those in the first book. If you like things in order, start here and then read Noah. Absolutely lovedI loved this book.5 stars no doubt about it.I loved how much it made me think.ponder.really ponder. It's great in so many ways.It's an action packed story.A bit of science fiction/fantasy, a bit of History, A bit of a love story.not just between husband and wife but a relationship with God.I will be getting more Brian Godawa's books.I am hooked. Please see:" When Giants were upon the earth"(also by the author) , in connection with this series! I find this prequel rather interesting...The research is compelling. this is a fun read ; just a little too much on the romance element. (stick with the story). a fairly interesting novel about how things could have happened. It starts off slow but gets better toward the end. I found the epilogue and background information about the mythology very intriguing and informative. I absolutely love this book series. It is fantastic! I'll be downloading the next book in the series tomorrow, Gilgamesh Immortal, and jumping right into it! My husband recommended this book because he knows I enjoy biblical stories. This is a great read full of action and adventure. Not what you think. Should be read before first book in series. Good book though but reading first book kinda is a spoiler for the rest. I enjoyed the book. it is an interesting story based in the biblical timeline. I'm not sure how I feel about the direction that was taken but I did enjoy the book. I loved the story. I was captured by the actions of war and intrigued by the relationships of Enoch, Lamech, and Methuselah. I enjoyed the quick and occasional references to Noah Primeval. Definitely should have been Book #1 in the series.